I initially heard about the "retro sci-fi strategy game" XO in May, when the intriguing debut teaser appeared in my email. 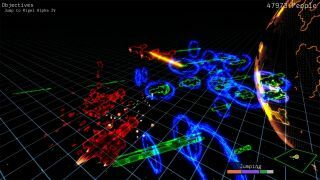 It puts players in command of humanity's last battleship and charges them with protecting a fleet of ships as it flees across the stars from an implacable, unstoppable enemy. The Battlestar Galactica influence is obvious (and acknowledged), but the developers say The Lost Fleet is also an inspiration, and there's a dash of FTL in there as well. Gameplay takes place on a two-dimensional plane, with procedurally generated events providing the core of the experience. There will be battles, naturally, and in fact the long-term goal is to make your ship powerful enough to stand against the enemy mothership so the fleet can escape with as many people as possible. But what promises to make it really interesting are the non-combat decisions: deciding where to go next and how long to stay, dealing with the many different kinds of events, and figuring out who can be safely trusted or ignored in the game's "complex political system." "You won't be able to save everyone," the Kickstarter description states. "As fleet commander, it's your job to make the call: do you save the damaged military destroyer to add more firepower to your fleet, the tanker that will extend the fleet's range, or rescue a freighter loaded with enough food to keep your people alive?" XO was assessed on the Square Enix Collective earlier this year, and today the project went live on both Steam Greenlight and Kickstarter, through which developer Jumpdrive Studios is seeking $40,000 to enable the game's completion. Kickstarters, as we like to remind you now and then, are inherently risky things, but this one is pleasantly deep and detailed, and the studio has been working on XO full-time for more than six months already. That's not an endorsement—you pays your dime and you takes your chances—but I do like what I've seen so far. The XO Kickstater runs until August 19, while the game is expected to be ready for released sometime in 2016. Find out more at Jmpdrv.com.